Jeremy Bottau at Bilgin Yachts tells me of a €1 million price reduction on the 45m motor yacht Tatiana. Launched in Istanbul in May 2011, she was built by Bilgin Yachts. With exteriors and interiors designed by renowned German designer Joachim Kinder, she enjoys all the benefits of an open yacht with the volume and comfort of a displacement vessel. Constructed in composite and completed with an Awlgrip paint system, Tatiana has RINA Pleasure Craft Class plus MMA LY2 certifications and comfortably accommodates up to 14 guests in six cabins including one master suite, one VIP cabin and three guest cabins. Eight crew are accommodated in four cabins in the bow area, including a crew mess. Powered by twin MTU 12V 4000 M90 engines, Tatiana cruises at a comfortable 16 knots with a top speed of up to 23 knots. 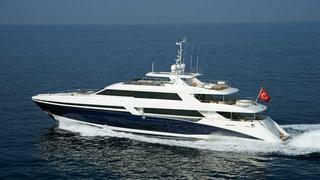 Tatiana was a finalist in the World Superyacht Awards 2012 and her new asking price is €13.5 million.